"That looks just like you..."
So I was on the computer last night tweaking the new little girlie that I am going to use for my new avatar when DH walks in. He asked what I was doing and I showed him my work. He goes,"Wow! That looks just like you! It's so cute." Awwwwwww, so nice of him to say. He usually doesn't care so much about my digi-scrapping hobby in general, so it was special for him to 1) take an interest in what I was making, and 2) indirectly say I was "cute"....even if it isn't the "real" me. Love ya babe! I am soooo lucky to have a sister-in-law (Stacie) that is an amazing hair stylist. It is rare that I go longer than 6 weeks without revamping the locks and getting a completely new look. So last week I went in for my monthly cut/color. 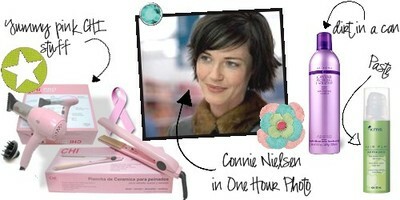 I'd seen the movie One Hour Photo on "On Demand" a few days earlier and while I HATED the movie (don't like Robin Williams playing a psycho), I was LOVING Connie Nielsen's hair. So I emailed Miss Stacie a screen-shot of the movie and she recreated the look on me! Wooo Hoooo! Love this style. Probably gonna be sporting the same one for a while now. I also picked up some new hair stuff to play with....CHI came out with a PINK flat iron and blow dryer that I couldn't resist. And then Stacie introduced me to Alterna products. OMGosh, do I love this stuff!!! My FAVE is the "caviar" line, with the top product being the Anti-Aging Working Spray. All the girls at her salon call it "dirt in a can".....it's not stiff and sticky like other aerosol sprays. Just adds tons of movable texture and makes my brunette tresses look FAB! Seriously can't rave enough about Alterna products. Try it, you'll fall in love!!! And my old stand-by that I've used forever-and-a-day is KMS Molding Paste. I switch (I'm a sucker for new stuff) but then always come back. The paste makes my hair "piece-y" without looking GREASY--Which is hard to do because I've got fine straggly hair that looks really gross in a hurry. Speaking of hair.....what the FREAK!!! I know it is "normal" for your hair to fall out after you have a baby....but, this is RI-gosh-darn-DICULOUS! Seriously! I pick strands of my hair out of Gray's fingers about 10 times a day. It's disgusting!! I don't remember it being this bad when I had Liv. Has this happened to anyone else? Am I abnormal? So I've been thinking about all the "free gifts" (snagged that from my sweetie, miss mccaig) that I see on other people's blogs. 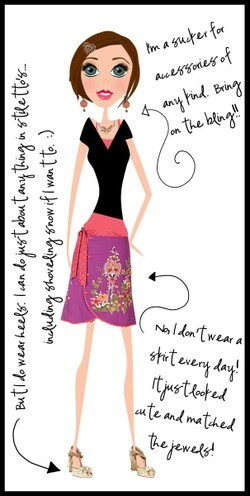 And I'd love to offer something to all the friends I've made since creating this little bloggie-poo. But I can't design digi-scrapping products, and probably never will, so I was thinking about offering something I CAN do. 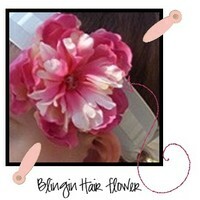 Maybe some hair bows for little girlies, or these cute little hair flower things that are sooooo cute. Would that be something you chickas are interested in? I couldn't give away a ton of them--no money tree in this kid's yard--but I could offer one to the first 10 or so people who emailed me with their contact info or something. Anyway, just thinking about it at this point, so let me know what you think. So Todd's birthday is today! Yippppeeee! One of my all time favorite things to do is give gifts, so I actually love other people's birthdays more than my own. (Well....unless I were to get the new camera lens I've been eying....then I'd probably like mine more! My birthday's in June if any of you wealthy souls want to contribute. teee heeee!) Personally I think I'm an EXCELLENT gift giver and I really try hard to think of something that the person will truly enjoy. So, Todd's not like the majority of other husbands that I know, and he really likes going to plays, musicals, concerts (I'm talking orchestra here) so I got him tickets to Joseph and the Amazing...... I am soooooo excited to give them to him! It is his FAVORITE show and we've seen it together about 4 times now. But it's always different so I'm sure it will be FANTASTIC. Can't wait!!! And since I think I've got to out-do Martha Stewart or something...I'll be making his birthday cake! And sadly, I am actually using one of Ms. Stewart's recipes. Brown Sugar Angel Food Cake with Hot Fudge Todd's very, very most favorite thing in the whole world is this ice cream. He literally plops down in front of the TV every night with the tub in his hand. And yes, sometimes he eats the WHOLE thing in one sitting. RIDICULOUS!!! So of course, we will be having Dulce de Leche on top of our cake, drizzled in succulent HoT fUdGE! 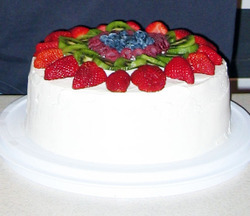 mmmmmmmmmm And just thought I'd throw in a pic of the cake I made for him last year.....just so you can see that I really do bake. And here's my most recent page. This was for Sara's CT (can I just say that she ROCKS), and I had so much fun with this amazing kit! I love the colors, and the paisley paper is just TDF! So anyway, happy St. Patty's day to you all! Hope you are sportin' some green! 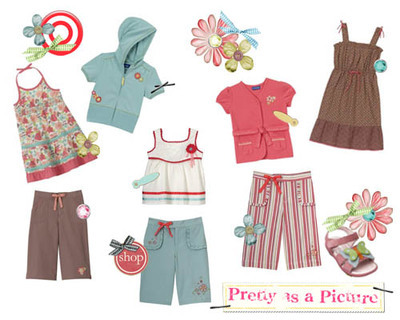 Ok...so here's the skinny on OliveJuice & Co: About 2 1/2 years ago I discovered children's boutiques. We lived in Texas at the time and I didn't know a soul, so Olivia and I would spend the day shopping. (Much to dh's dismay-- LOL!) I was blown away at these GORGEOUS outfits and the attention my darling baby would get when she wore them. So after the zillionth trip to Haute Babies (my fave boutique) something clicked and I thought to myself, "Hey, I can make stuff like this." And my passion began. Now, I come from a sewing background....my mom has a degree in clothing design, and actually owns her own business designing wedding gowns and formal wear. So I grew up around mounds of fabric, needles, and thread. In fact, as a child I'd have to remind my mom to remove the measuring tape that was draped around her neck when we'd go to the supermarket. :) So at first I just started making little outfits for Olivia. It was so fun! I'd walk into a fabric store, find a piece of fabric, and automatically "see" what I wanted to do with it. Then I'd call Mom and have her tell me what to do. Pretty soon, I got to where I could do it by myself, and I'd stay up until 3 am sewing an outfit for Liv to wear to the playground the next day. PATHETIC!!! Everywhere we went, people stopped to ask where I'd gotten her get-up. When I told them I made it, they automatically asked if I sold them anywhere.... And that's where OliveJuice and Company was born. The "Olive" for my sweet Olivia Kate, "OliveJuice" because it looks like you are saying "I love you" when you mouth the words (it really does...go look in the mirror), and "Company" because it just sounds cool. (And eventually, when my babes are all grownsed up and in school, I'd like to devote more time to it and add a boys line...so I felt like the Co. would let me do that a little easier.) Unfortunately, I haven't created anything for for the past 3-4 months (my new digi obsession, and taking care of baby Gray uses up most of my time) but I'm itching to put the pedal to the metal soon. (sewing pedal, that is--LOL) I'll post some pictures of my designs when I finally get back into the swing of things again. She did soooooo GOOD! I am so proud of her. We walked into school and she says, "Mom, I really want to join the other children." And off she went. I actually started to tear up!! :( My sweet baby is turning into such a big girl! I stayed and watched her for about 45 minutes, but she was doing so good that I decided to go run some errands. (My mom was watching Gray so I was FREEEEEE! LOLOLOL) So I returned to pick her up an hour later and the kids were just coming out of math class. As soon as she saw me she bolted into my arms and goes,"Mommy, where have you been? I was worried sick about you." I guess while they were having playground time, the kids started playing a little rougher than she was used to. (Told ya she's been pretty sheltered.) And she got upset. She's NEVER been in a situation like that and it made her really nervous. I asked if she had fun and she said, "No! Those children are too crappy." HUH? "Crappy!" Where did she hear that? So I asked what "crappy" meant, and she said, "There are too many children, and they were mean on the playground, and laughed at my boots." So somehow, she heard the word crappy and that is how she felt about it. She said she wants to go back, but next time Mommy needs to stay with her. Which I will gladly do. I'm just proud that she actually joined in, and didn't seclude herself the whole time!! Here's my latest of my smooshie little Gravy! Man I love this kid. He's just got the sweetest little mug and I could smooch him all day. I thought Holly's new kit went perfectly with this pic. Didn't even have to tweak the colors. 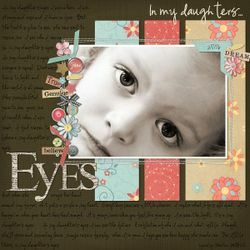 Credits: Nearly everything is in the *NEW* Create kit by Holly McCaig and Kristi Nerness (hollymccaigdesigns.com). This kit RAWKS! Date ruler is in the Memories kit by Holly, and the "words" by Holly also. Felt stars by Amy Martin (modscraps.com). Staples by Kristie David (shabbyprincess.com) Brads by Sara Carling (sweetshoppedesigns.com). BTW...Let me know if the music makes you NUTS! I started a thread about it at twopeas and got some replies from people saying they don't like music on blogs (mostly from those suffering from "dial-up-itis"), but then a couple people emailed me saying they like it. So I added some tunes for now. 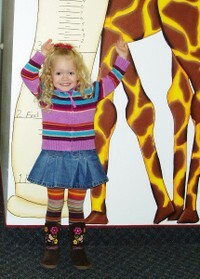 I have to say.....Miss Olivia is a very bright little girl (and I'm not just saying that because I'm her mommy. LOL) She has always been an unbelievable talker, and she remembers EVERYTHING she sees or hears. At just barely 3, she knows most of her letters (names, sounds, and how to write them), all of her numbers to 15 (she can count to twenty but only recognizes up to 15), and has a very active imagination. She is a budding artist and loves anything to do with painting, coloring, drawing, sculpting (play-doh LOL), etc...Where she falls short is in her social relations. She is VERY outgoing and interactive around adults and older children...but as soon as someone her own age appears, she clams up and doesn't even resemble her normal spunky self. So I decided that it would be good for her to go to preschool! I couldn't care less about the learning aspect (although that would be nice)...all I'm interested in is getting her to break out of her shell. I don't mind at all if she is "shy" naturally...HECK- I used to be a TON more introverted than I am now. :) I just don't want her fear of other toddlers to continue to plague her just because she has been sheltered by her dad and I. So her first day of preschool is TOMORROW! YIKES! We'll see how it goes. Hopefully she doesn't go off by herself and stand in the corner to observe the whole time. I really need to post some of my OliveJuice and Company designs on here. (Especially since that is the name of this crazy bloggie-poo.) Not that anyone even cares about the schtuff I do, but it would be fun to get some feedback. I guess I should probably explain a little bit.....but that will have to wait until next time. This post is already super-duper long. So dh goes on a ski trip to Targhee every year with his buddies. Which I am more than happy to let him do because he comes back all rejuvenated and super nice. (Yeah, definitely willing to tackle the kiddos by myself for a few days to get my sweet little hubby back!....absence makes the heart grow fonder, I guess.) He left on Thursday, and just got back today! WoooHooo! Being a single mom would be TUFF!!! What I want to know is....when do the mommies get to go on a trip and get all rejuvenated? It's sooooooooo much harder for me to break away for a much needed vacation with the girls, than it is for him. (And IMO I NEED it a lot more!) So- I was talking with one of my friends tonight and we tentatively planned a little weekend get-a-way for this Saturday. I'm crossing my fingers that it doesn't fall through! I'd LOVE for it to be an overnight thing....but chances are that the boys won't be able to watch the kiddies that long. DOH! Oh well, I'll take any R & R I can get. Speaking of which, Gray is STILL having trouble with that whole sleeping business. (Yes, I know I just posted about this....but it's making me NUTSO!!!) Just thought that maybe if I complained about it on here, the magic blog fairy would come sprinkle sleepy dust in his little peepers and my problems would be over. Bwaaaahahahaha! No such luck! Enough about my insomniac baby! So, since I was all by myself for a few days (and not sleeping anyway), I did get a couple pages done. Both of them were for Traci's creative team. I am seriously ADDICTED to this digital scrapping schtuff! I absolutely HATE paper scrapping, but adore doing it on the computer. Funny how that works! I love that it gives me a creative outlet...AND...there is no mess to clean up! Everything stays neat and tidy and I still get to document my life. Works for me! And the last little tid-bit ....I was all geared up and ready to watch my beloved Grey's Anatomy tonight (missed last week-DRAT! ), got the babes all in bed and plopped down on the couch with my microwave popcorn....AND....no Grey's! Oh man, I forgot the Oscar's were on. Not that I don't like the Oscar's. (In fact, a long time ago, in my life before diapers and slobber, Todd and I were quite the movie buffs. Now....not so much.) I still like to see who won (and look at all the pretty dresses---that's the clothing design aspect of me talking) but I had my little heart set on seeing "McDreamy". Next week is a long ways away. There are very few negatives about being a Mommy! I truly love it, and would have a zillion little babies if time/$ allowed (and I didn't have to be PREGNANT!! LOL). But it is DANG hard work!!!!! I honestly have not gotten over 5 consecutive hours of sleep since Gray was born in September. (And that is a good night....4 hours is the norm.) Between cleaning, my never-ending list of hobbies (sewing, digiscrapping, baking, shopping-LOL!, etc...), and taking care of the babes, it is rare that I am in bed before 2 am. Just when I start to catch some ZZZZZZ's Gray wakes up! uhhhhhhgggg... The little guy is soooooo darn adorable and has the sweetest little personality...but he Suuu-uCKS at sleeping. And the worst part is that I know it is MY fault! He had "colic" when he was tiny and the only thing that helped was putting him in the swing. So we've relied on it as a sleep prop for the past 5 months. We try so hard to get him to sleep in his bed, but when he cries it just breaks my heart and I end up sticking him back in his swing. DRAT! It was a life-saver in the beginning....but now I want to throw it out the window. Until 3 am comes around and then I'll do anything to get a little extra shut-eye. So the cycle continues! OK....enough complaining...onto the good shtuff! We had a busy, but fun day today and Olivia was an absolute angel! That girl cracks me up! We had our neighbors over for lunch and while I was in the kitchen finishing up I heard her tell them, "I'm so glad you could come over to visit me. I'm really enjoying it!" She is soooooo articulate for a girl who just turned 3! I'm seriously AMAZED by her imagination and the things she picks up. After lunch, I was laying down on the couch with a headache and she went and told Todd, "Daddy, Mom is not feeling good. I need to get her some tylenol. That will make her feel all better!" So Todd got some ADVIL and she brought them over to me and goes, "Here you go little sweetie!" and kissed me on the forehead. She is such a DOLL! Love that kid to pieces!!!! 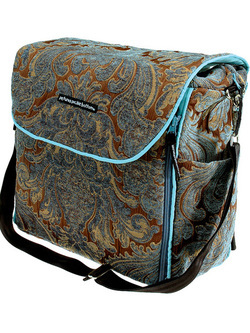 And I've been searching for a new diaper bag and found one that I ADORE! It is by Petunia Pickle Bottom and is made from the PLUSHEST fabric! It's gorgeous in real life and I just love the colors for a baby boy. The only problem is....it's $150.00! Ca-CHING!! Guess I'll be saving my "allowance" $$$ for this baby. Who says you have to carry poopy diapers in anything less than pure FABULOUSNESS!?! ?